Do you have engaging, relevant, and advanced content for school and teacher leaders? Are you an expert on best practices that help move the needle on student achievement and can be replicated? Consider submitting a proposal to present at the 2019 National Charter Schools Conference! Submit your session by logging into the Presenter Portal. The NCSC19 Call for Proposals is now open through February 1, 2019. We’re looking for charter school educators, leaders, and advocates who are reimagining education to present at NCSC19 on June 30 – July 3 in Las Vegas. Prepare your session proposal now! Download the session proposal template to develop your ideas into a cohesive proposal. 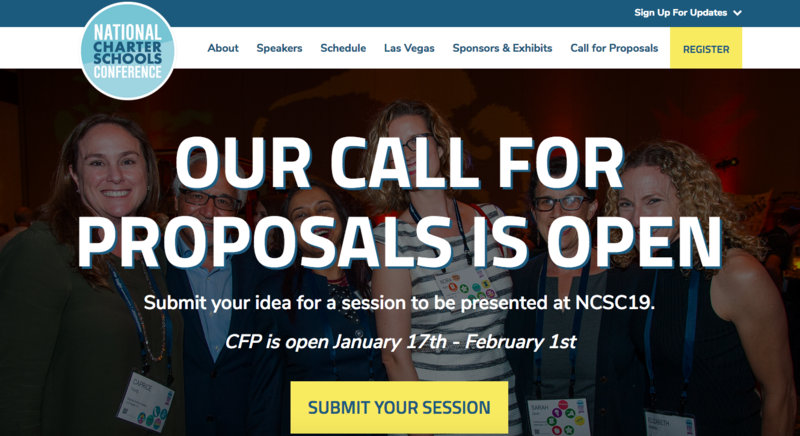 Review the NCSC19 Call for Proposals Informational Webinar recording and slide deck to learn more about our audience, needed content, and how you can write your best proposal. Submit your proposal by logging into the Presenter Portal by 11:59pm EST on February 1, 2019. We will not accept proposals submitted via email. Visit the NCSC website for more information. You can also contact us at presenterinfo@publiccharters.org.